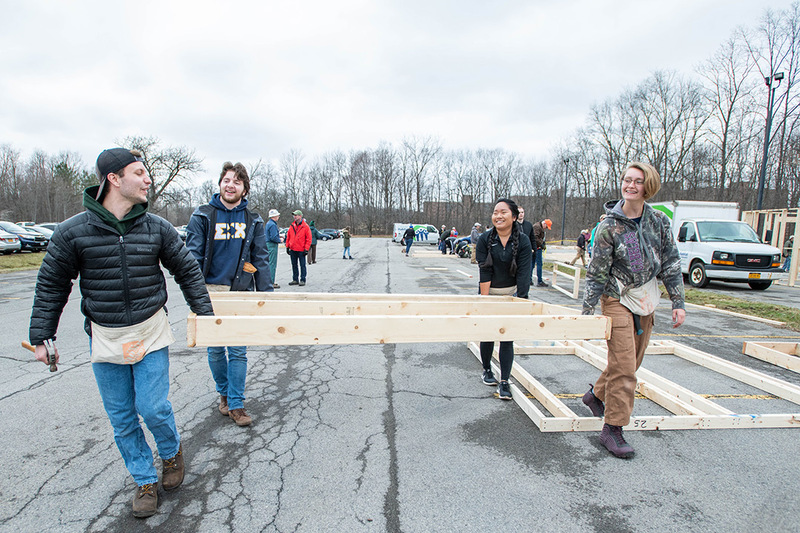 From left, Anthony Farrar, Jacob Davies, Emilyn Nguyen and Alea DeLong carry a constructed frame during Framing Frenzy, part of a Service Week community project. More than 200 RIT students helped Flower City Habitat for Humanity by building frames for two houses that will be erected in Rochester. Kylie Pleakis had never hammered a nail into anything before her volunteer shift yesterday at Rochester Institute of Technology’s “Framing Frenzy,” but that didn’t stop her from helping build walls and frames for two two-story houses for Flower City Habitat for Humanity. 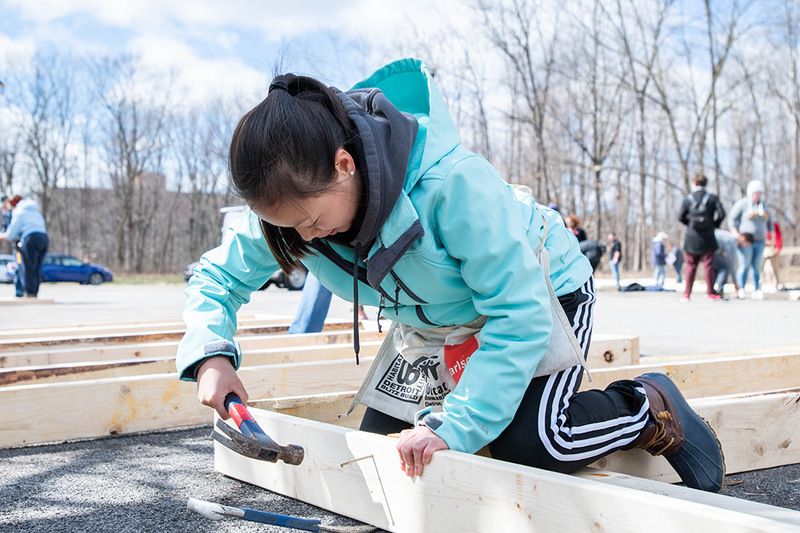 Gabrielle Plucknette-DeVito Kylie Pleakis, a fourth-year applied math major from Allegany, N.Y., hammers nails to a frame during the Framing Frenzy as part of Service Week on Wednesday. She was one of 200 RIT students, faculty and staff members who participated in the construction as part of Service Week. The week provides dozens of opportunities for students to volunteer in community services, ranging from clothing, food, book and blood drives; cemetery and trail cleanup; and donating school supply kits to elementary students. Framing Frenzy is also one of the “50 Acts of Kindness” events held this academic year to commemorate RIT’s 50th year at its Henrietta campus. The initiative encourages the RIT community to actively participate in the betterment of their communities through direct service, philanthropic giving and/or active participation in awareness-raising programs and events. 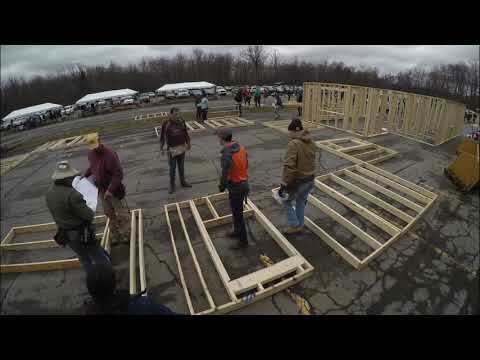 Organized by RIT’s Center for Leadership and Civic Engagement, Framing Frenzy was held in three shifts, as dozens of students received information about Habitat for Humanity, then instructions on what they would be doing. Soon, students were placed in small groups, given a hammer and nail-filled aprons, and started pounding away. About 20 “hammer and saw” volunteer supervisors among them told them how to line up, hold and nail together the stacked lumber. Gabrielle Plucknette-DeVito RIT students, from left, Nicole English, a first-year student from Northborough, Mass., and Ricardo Carrion, a second-year student from Rochester, work together during the annual Framing Frenzy. More than 200 RIT students helped Flower City Habitat for Humanity by building frames for two houses that will be erected in Rochester. Once completed, the teams walked their frames to a pile, where they were erected into a makeshift house to show how big the 1,900-square-foot homes were. They’ll be built on Holworthy Street on Rochester’s west side and ready for move-in this time next year. The future owner of one of the houses visited the scene and thanked the students for their work. She and her husband, refugees from Somalia, have nine children, including one with special needs. The family is currently living in different states, so she looks forward to her family living together again in their new home. 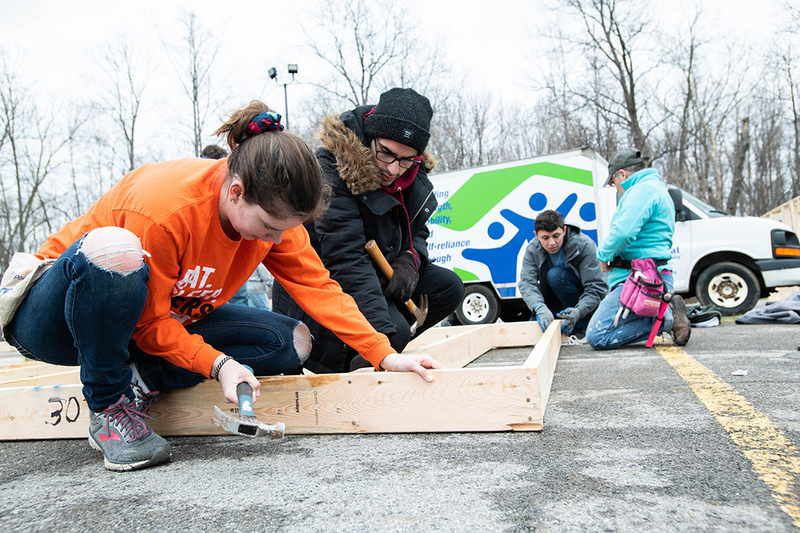 O’Neil said many of the 200 active students in the club spend each weekend building, installing dry wall, putting on siding and other projects for Habitat for Humanity homes on sites usually in Genesee County. But this event on the RIT campus introduces more students to the work they do. “This event is big for the RIT community to come together to make an impact on the Rochester community,” said O’Neil, a fourth-year biochemistry major from Plaistow, N.H.
Andrew McPherson, a fourth-year electrical engineering major from Baldwin, N.Y., was one of several members of RIT’s varsity track team to volunteer hammering nails. “I just wanted to do a nice thing for the community and also represent the track team,” he said. The Flower City chapter of Habitat for Humanity has built or remodeled nearly 250 homes since 1984. The new homeowners, who are people who have a need for improved housing, purchase the homes after qualifying for a mortgage and agreeing to partner with Habitat for Humanity in future projects. Flower City Habitat for Humanity CEO Matt Flanigan said RIT’s efforts will save them six weeks of construction time.